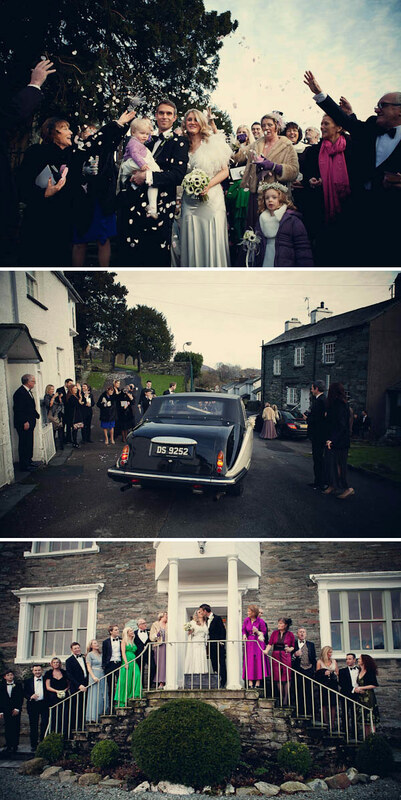 A Winter Wedding In The Lakes. 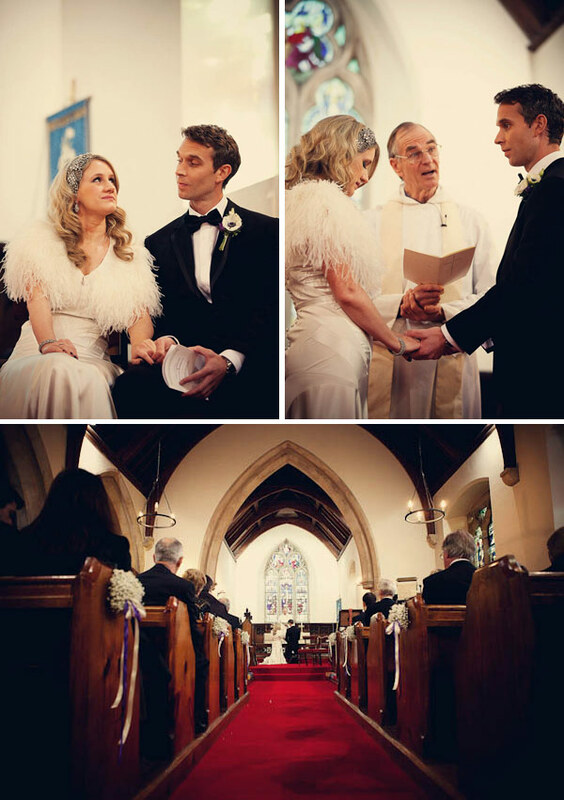 Lucy and Fraser married in January 2012. 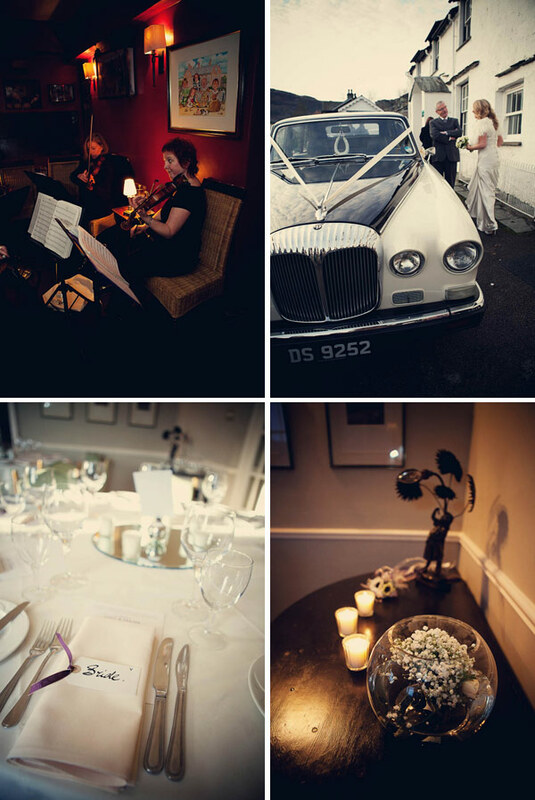 It was a vintage winter affair complete with open fire, classic décor and period fashion. 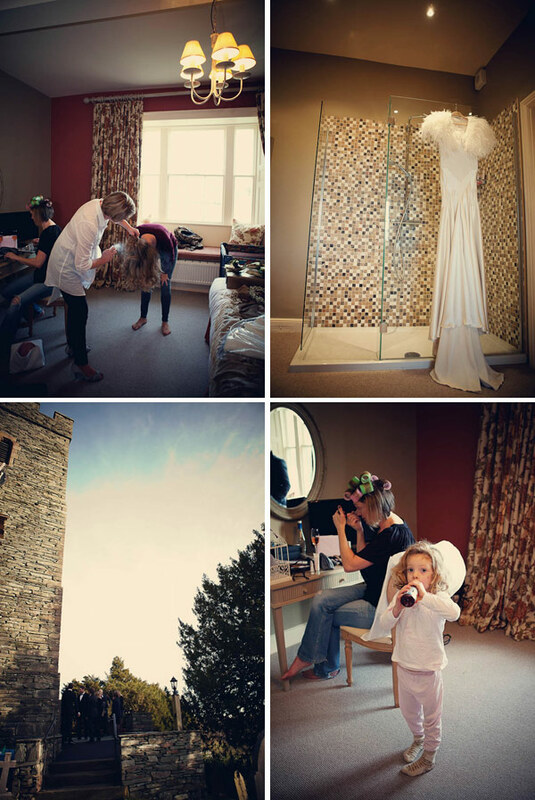 The reception venue was the Eltermere Inn in Elterwater and the photographer that Lucy and Fraser chose to document their big day was the super sassy Assassynation. My dress from Belles Bridal Boutique in Liverpool and the designer was Heirloom Couture – was the first and last shop I went to, Geraldine the owner understood exactly what I wanted, an understated but elegant gown with a vintage feel (which is very much how we felt about the wedding venue we chose, a place we often visited on our trips up to the lakes – somewhere very close to our hearts). My hairpiece by Jenny Packham and my earrings were from a vintage shop – I loved the vintage feel to the headpiece and it complimneted the 1930’s feel of the dress and accessorised perfectly with the clasp on my belt (cast from an original 1930’s clasp). 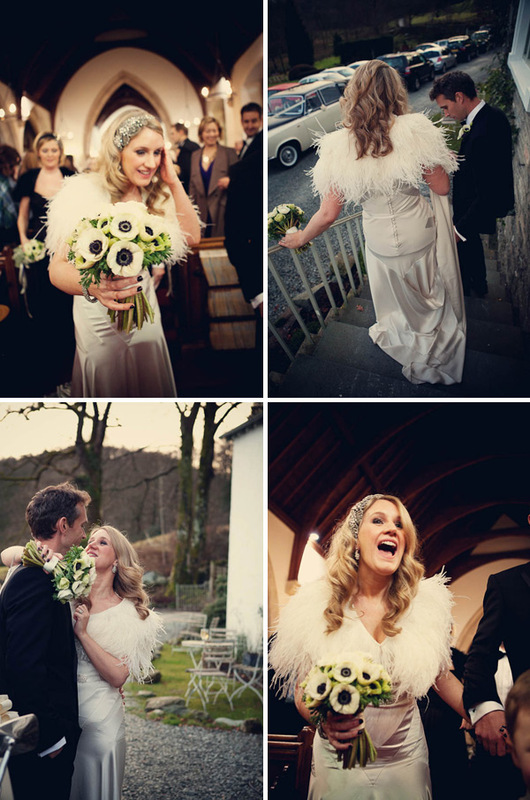 One of the other reasons I loved the dress was because I could accessorise it and give it that real vintage feel – worn with an ostrich feather cape also by Heirloom Couture from Belles Bridal Boutique. I wore Giuseppe Zanotti 4 inch heels – bought off ebay! I Wanted a beautiful pair of shoes but knew I will never wear them again – and going second hand meant that I could spend a bit more on everything else! I did my own hair and makeup with a little help from the Bobbi Brown counter. We chose anenomes because they were a flower that was in season and they are such a striking flower – which meant we could keep it simple yet striking. My bouquet was just anenomes, the bridesmaids had anenomes and white ranunculus with a mixture of both on the tables and simple anenome button holes. 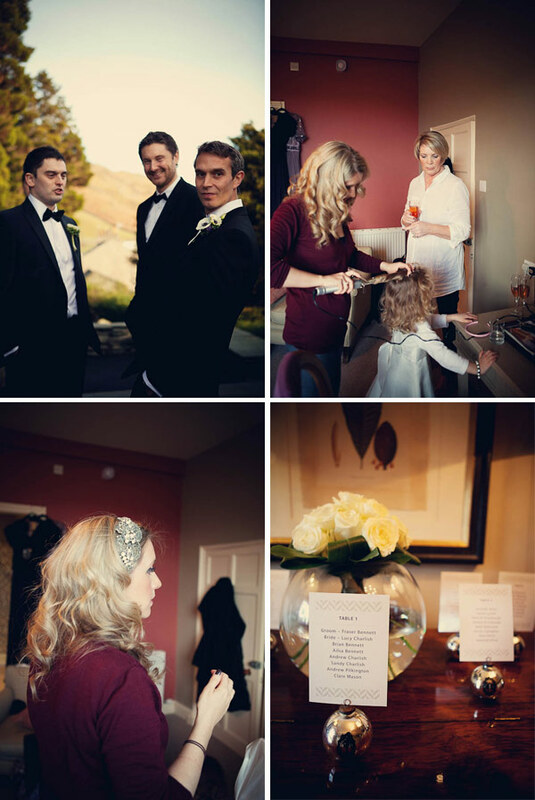 They looked beautiful within the simplicity of the room where the reception was held – all teh flowers were by Alex at The Flowershop in Ambleside. 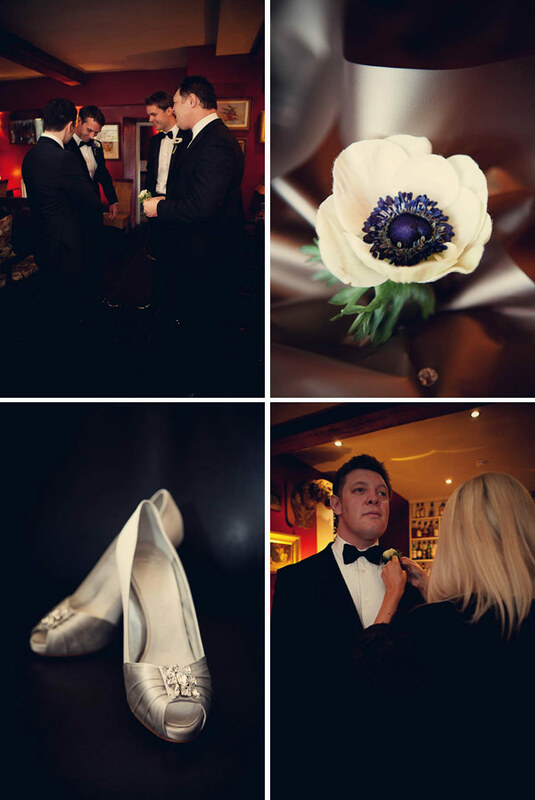 The groomsmen wore black tie as did all of the male guests – we really wanted to have a feeling of old school glamour, especially as my dress had a vintage feel and against the backdrop of the venue. It was great to see all of the men looking so smart! My bridesmaid (my sister) wore a long black dress with a matching feather shrug and also an elaborate headband; my 3 year old niece was a flower girl with her own little faux fur shrug and a gypsophila headband. 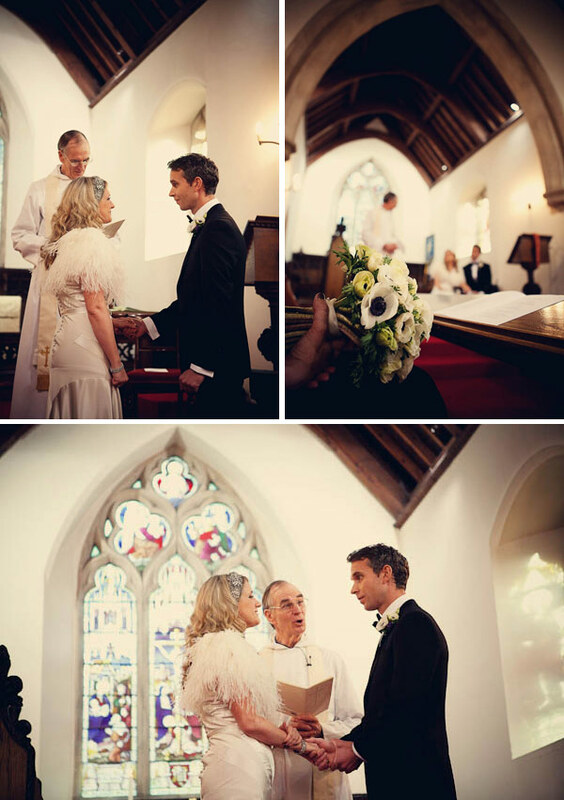 My handsome husband wore a black dinner suit with bow tie and patent leather shoes – he looked amazing. Especially so because I’m used to seeing him in the lakes in a muddy pair of walking trousers and a fleece – he scrubbed up very well! We choose Assassynation to be our Photographer. 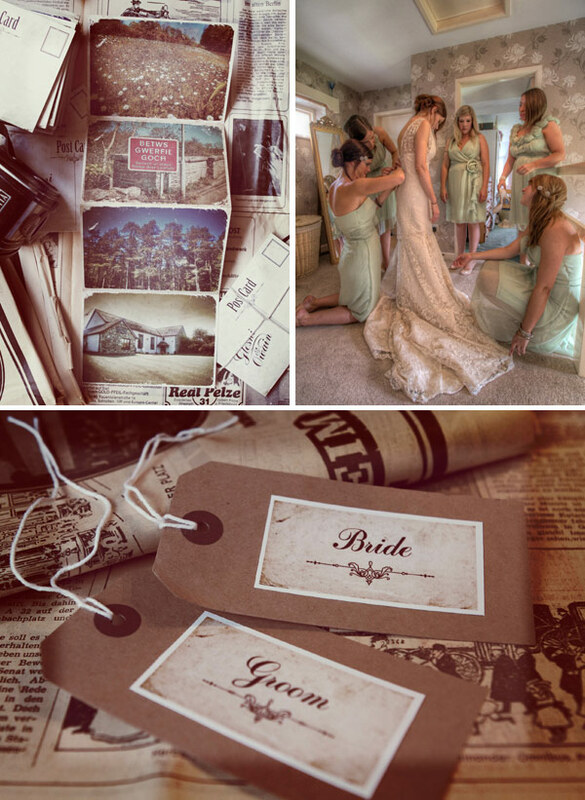 We wanted our images to be relaxed and really capture the feel of the day which is what I felt Sassy’s reportage work did. 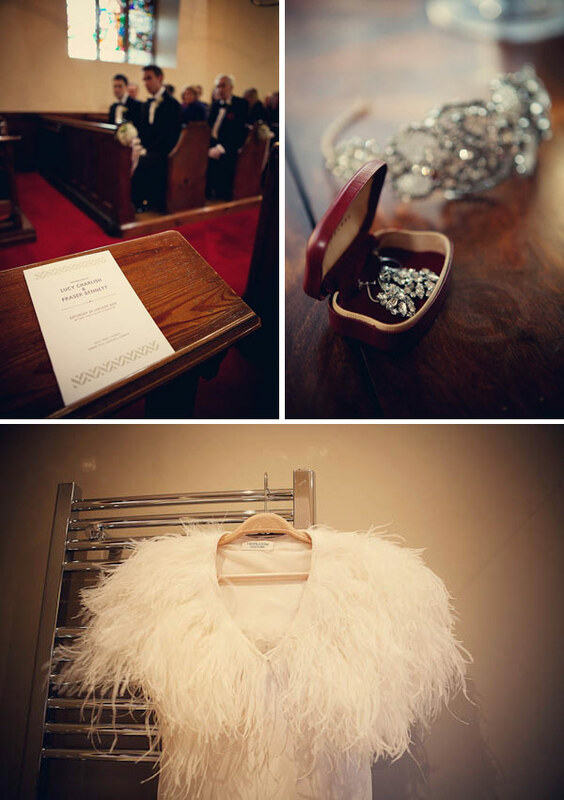 I also loved the vintage and sometimes tongue in cheek nature to Sassy’s work- something we felt would be suited to the venue and our wedding. She lived up to expectations and managed to catch everyone at some point during the day, and she also got some unforgettable shots of our daughter. For our cake we went to Marks and Spencer and then decorated with anenomes. White chocolate plaques with a chocolate sponge (yum). 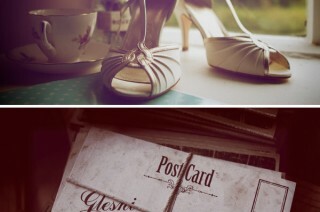 I loved the deco inspired design and it was perfect with my dress and the deco inspired stationery from Yield Ink. We really didn’t feel it made it any less of a party as it was a great chance to get to chat to everyone and there was even some impromptu dancing in the bar. 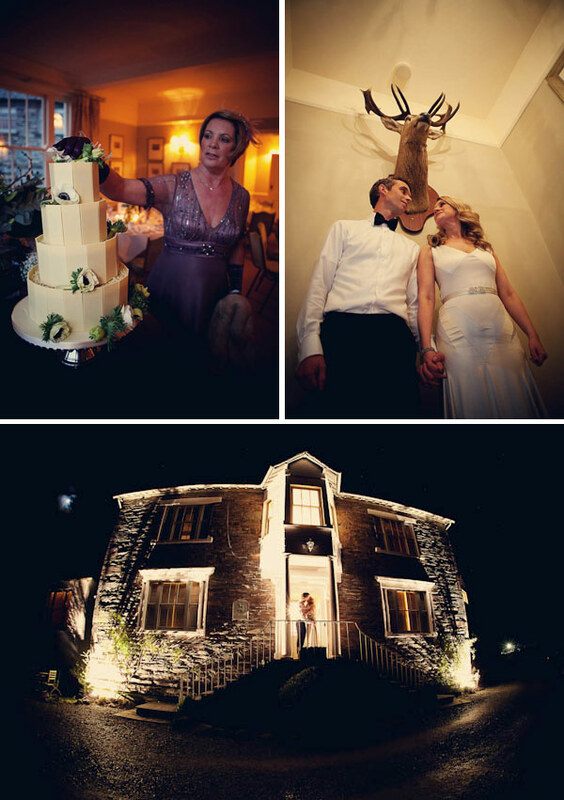 Décor – the setting of the hotel in the langdale valley was the real wow factor for us – Elterwater is a place we love and we wanted everyone to share in our love for the place too. Eltermere Inn has everything you would expect from a Lakeland hotel – roaring fires, great locally produced food and a beautiful classic interior (and lots of stuffed animals…). 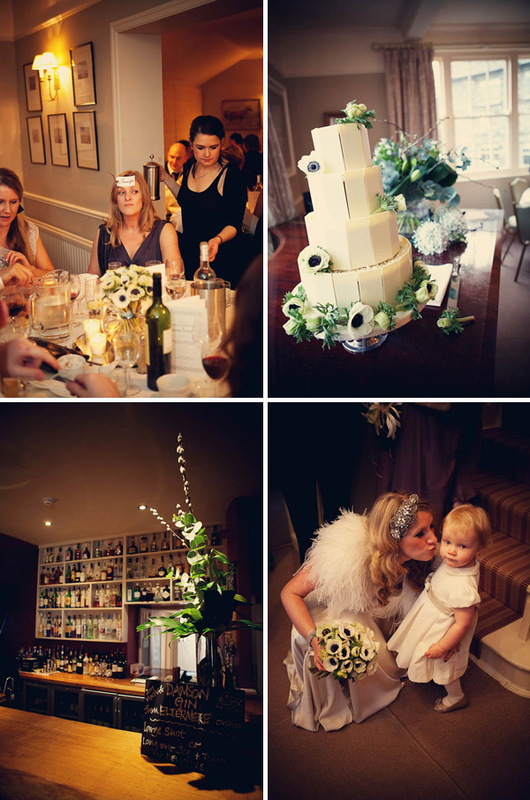 We therefore wanted to keep décor simple with a deco feel – simple anenomes, votive candles and deco inspired stationary. 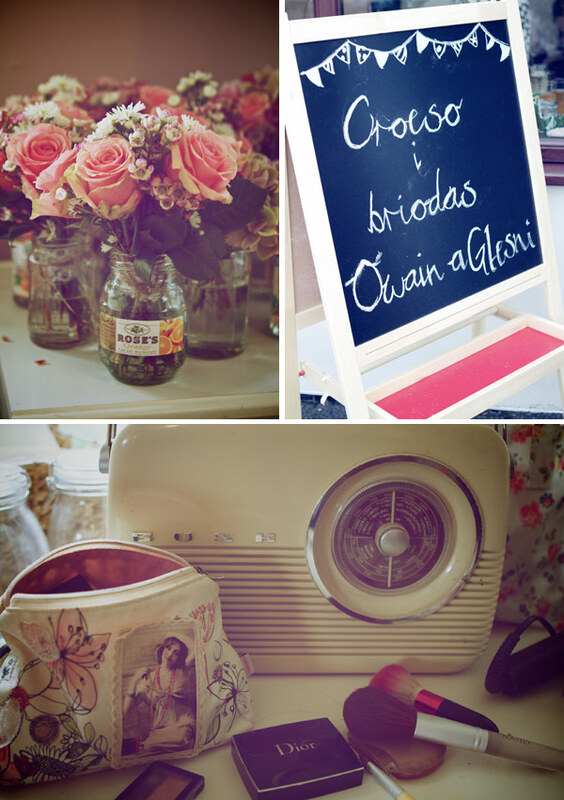 My advice to a bride to be – relax and enjoy! That applies as much to the planning process as the day itself. 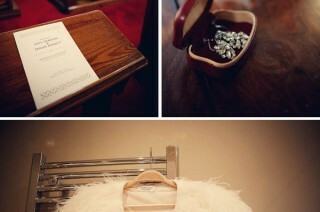 It’s going to be one of the happiest days of your life and so planning it should be enjoyable too. What was most important to us was being surrounded by our close friends and family and to keep the wedding to a moderate size (75) so we felt on the day we could spend a bit of time with everyone. 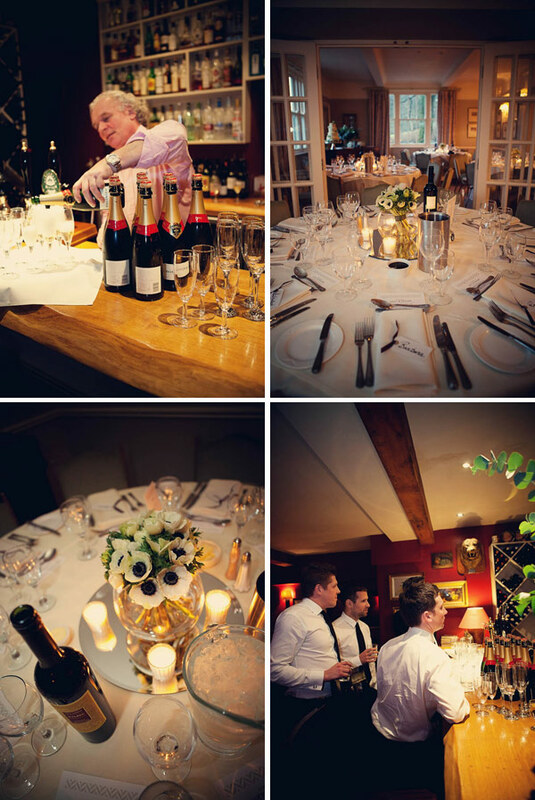 We had wanted it to be fairly low key with amazing food and lots of champagne and vino flowing. The ‘James Bond’ effect – If you want to go super smart and formal but a morning suit isn’t your bag then I think the DJ and dickie bow is an absoulte winner. The laidback approach to the décor and design, when a venue has the right character and the right look and feel for your big day, it is sometimes unneccesary to add much into the mix. Thanks to Lucy and Fraser for sharing their most intimate winter day.